ProVISION ASIA has helped over 6,000 people with disabilities. We’ve been serving children and adults with disabilities, mostly from economically challenged backgrounds. But just as we think we understand these precious lives, there is so much more that we are yet to discover and even more that we learn each day. Our clients are not just clients, they are our friends! From these friends, we constantly learn ways of positive living and the true implication of the quote ‘where there is a will, there is a way’. 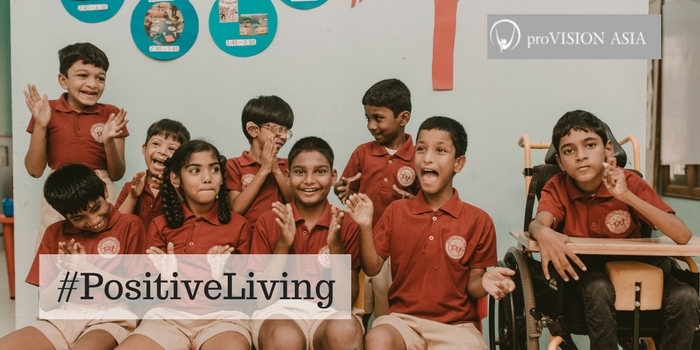 In a world where society tells us the norms of what people with disabilities can or cannot do, our friends at proVISION ASIA have been breaking norms and proving to us that disability is only a mindset. #1. YOU REMIND US: that life is a gift and that we should not take it for granted. No one is better than another, or lower or higher than another; just different. And we can celebrate those differences! #2. YOU CHALLENGE US: to examine our own shortcomings– and the excuses we make, preventing us from living positively. We may not be able to change our circumstances, but we can improve our attitude. It is not uncommon for me to throw up my hands in frustration when thwarted; but then I met Nick, who was born with no arms, or legs. It’s easy to complain when the Uber doesn’t come on time– but what if I had to assemble a wheelchair, in order to leave our homes? And how can I own two pairs of eyeglasses when some of my friends have eyes that do not see? #3. YOU TEACH US: practical ways to reach into the lives of people with disabilities. How should I approach someone in a wheelchair? How might I effectively communicate with a person who is hearing-impaired? What ways could I assist a child who has cerebral palsy? Hearing directly from one who is dealing with a disability will provide clarity and equip us to better serve the disability community. People like Muniswamy, who speaks from a lifetime of wheelchair confinement; or young Suresh, who has an amputated leg, who are both able to provide insight far more useful than a textbook! #4. YOU INSPIRE US: by example, to turn our whining into winning. To turn greediness into gratefulness. To turn living negatively into living positively. To do what our wheelchair tennis players like Suresh do; not allowing his lifeless limbs to limit his dreams of being a successful athlete on the courts. Or Shahina, proactively in overcoming her physical disabilities through weightlifting competitions; or Srinivas, whose withered leg from polio– and lack of emotional support from friends and family– did not deter him from eventually becoming a State Bodybuilding Champion in Karnataka. Often against all odds: poverty, a dysfunctional home; religious oppression, where a disability is considered a curse…our friends with disabilities are proving to us the power of positive living! Through the stories of the many disabled people we work with, we would like the spread the message of positive living amongst the people of the world. Disability is more of a mentality than a condition. Our friends with disabilities at proVISION ASIA teaches us every day to make the words IMPOSSIBLE to I’M POSSIBLE. If you would like to know more about the work we do at proVISION ASIA, we’d love to have you over to spend some time with our heroes. Do write to us. Let’s take a new look at life together!